Warriors have likely been wearing helmets since the beginning of man's fighting history. After all, one's head is an important part to protect! Here at Medieval Armour, we offer a number of helms and helmets that range in use from functional helmets for protecting your head in battle to LARP helmets designed to enhance your warrior appearance. Like the traditional warrior's sword, helmets can come in all different shapes and styles, ranging in design to suit the wearer's need and taste, which is why we've compiled as many helmets as we can. Some of our helmets are historical replicas that recreate different styles of helmets from different periods. For a truly historic look, a Greek helmet or a Roman helmet is just what you need. 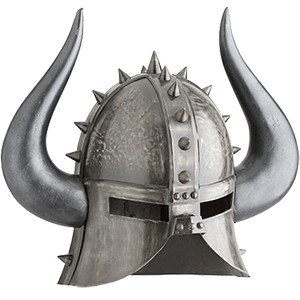 Crusaders and knights will want to check out our medieval helmets, and a wild warrior of the North will even find a few Viking helmets that will suit their tastes. And if you're looking for something a bit more eccentric and esoteric, then you'll find all manner of impressive and intimidating options among our fantasy helmets and our live action roleplaying helmets. We even offer a number of lighter options in the form of leather helmets, which are made from quality leather. Of course, not all helmets are made for wearing, so we also have a number of helmet stands that are perfect for displaying your favorite helmets, whether they're medieval helms, Japanese helmets, Viking helmets, or more! 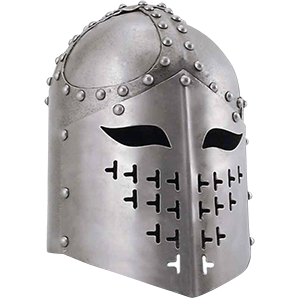 And if you're actually fighting, an SCA helmet is just what you want, as these steel helms are bound to provide all the protection your skull will need against a few good knocks. There's a wide world of helmets out there, all waiting for just the right warrior to come along and pick that exact design. You might be that warrior, so take a brief hiatus from whatever you're doing and browse through our Helmets section here at Medieval Armour. Even if you're not planning on wearing one, you might just find one that's definitely worth displaying. The fantasy helmets at Medieval Armour are a distinctive bunch, featuring an assortment of impressive designs that are inspired by all manner of different realms of fantasy. And as functional as some of these helmets are, their functionality is often eclipsed by their impressive designs, which serve only to enhance one's appearance as a warrior. Virtually all of our fantasy helmets are also steel helmets, making each one a reliable and strong helm that any warrior would be happy to wear. Some are decorative, while others are fully functional helmets that are designed to take a good knock or three, providing a good degree of protection against blows that might befall a warrior's skull. We also offer a number of movie helmets, many of which are inspired by and modeled after the helmets worn by famous fantasy figures, such as Conan the Barbarian. Of course, not all fantasy helms are inspired by movies or fiction. Some, like our Undead and Black Ice Helmets, are just impressive works of pure fantasy that none-the-less are quite amazing to behold. And speaking of undead things, we even have a few impressive skull helmets, which will render any warrior's visage into that of a hellish skull straight from the afterlife! There's virtually no end to the wild and impressive designs when it comes to these fantasy helmets. After all, a good barbarian helmet is so hard to come by...but luckily, you can still find that and so much more right here in the Fantasy Helmets, Fantasy Helms, and Movie Helmets Section of Medieval Armour. Thanks to the amazing success of several Greek-styled movies, Greek helmets have become something of a modern fixation. And at Medieval Armour, we offer a number of these classic Greek helms, featuring ones that were seen on-screen as well as ones that were used by Greek hoplites and Greek warriors throughout history. The most iconic of Greek helmets are without a doubt the Corinthian helmets. First used by soldiers of the City-State of Corinth in Ancient Greece, this brass helmet gradually gained widespread use across the whole of the Greece. Even today, the traditional Spartan helmets are actually just stylized Corinthian helmets that were modified to suit the Spartan's needs. Even Trojan helmets took influence from this well-traveled helmet! 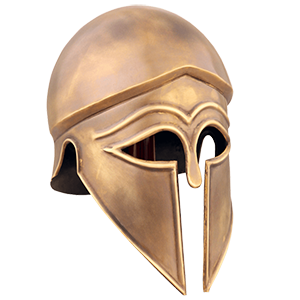 Traditional Greek helmets, as briefly mentioned above, were made in brass, although we also offer steel helmets in order to provide a Greek helmet that is more for function then for display. We also carry Greek plumed helmets, which feature colored plumage that helps to make the helm stand out. There are even a few royal Corinthian helmets floating around, which feature both plumage and impressively ornate designs fit only for the rulers of Greece's great city-states. And of course, what would a Greek helmet section be without at least one or two helmets modeled after the helms of the Spartans, worn in Frank Miller's 300. If you want a regular 300 Spartan helm, you'll find it here, just like you can also find Leonidas' Helmet, with its regal black plume. From movie to history, Medieval Armour has all the Greek Helmets, Corinthian Helmets, Trojan Helmets, and Spartan Helmets you could ever want or need! In many ways, samurai helmets are unique. Distinctive in their design, no other culture across the globe featured such personalized and impressive helmets. Combining protection and style into one seamless whole, these Japanese helmets are all impressive displays that are incredible collectibles, as well as fantastic and wearable recreations of historic pieces of oriental armor. Traditionally, a Japanese great helmet like the ones featured here consisted of two parts, the menpo and the kabuto. A Japanese kabuto is the actual helmet, while the Japanese menpo is the war-mask, or the face of the helmet. Decidedly oriental in their feel, these Japanese helmets are almost all recreations of historic pieces that were worn by great warlords and daimyo of the Japanese Feudal Era. Examples of these great warriors and their noteworthy helms are the Date Masamune Helmet, with its distinctive crescent moon crest, the Oda Nobunaga Helmet, which is modeled after the helm worn by one of Japan's most premier warlords and warriors, and the Takeda Shingen Helmet, which features the distinctive red color and bestial crest, befitting the warrior's nickname as the "Tiger of Kai". Many of the oriental helmets featured here come with their own stand, and some, like the Daisho Kake Helmet, feature a stand that can even double as a sword stand! 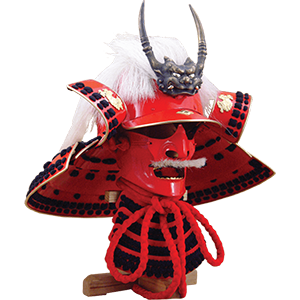 Enthusiasts of Japanese history and culture will that these replicated helmets of Japanese samurai are incredible and attractive collectibles, ones that we at Medieval Armour are happy to provide! Helmets aren't only for providing protection to your head. Some, like these live action roleplaying helmets, or LARP helmets, are designed purely for aesthetical reasons. What this means is that while these LARP helms won't provide the sturdiest of defense, they will offer you an impressive look that is a compliment to any fantasy or medieval style. And since live action roleplays can cover a wide variety of scenes ranging from purely historical to pure fantasy, the LARP helmets at Medieval Armour run across a wide gamut of styles, ranging from classic medieval helmets to simple elven helmets, down even to impressive fantasy helmets that transform their wearer into fearsome skull faced warriors! And that is not even half of what we have! Many of these LRP helmets (live roleplay) are made of a soft, synthetic material that is designed for comfort and painted to resemble metal and steel, giving them a realistic look without replicating the weight or hard edges of a traditional helmet. Some of our LARP helmets, however, are also leather helmets, which ensure that some offer a nice medium between limited protection and impressive style. Before you march off to do battle in a live action roleplay with your friends and foes, it's best to make sure you're properly attired and armed. 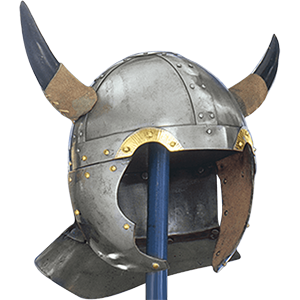 And while you're at it, check out the Medieval Armour's section of LARP and LRP Helmets, where you might just find something that's perfect for you. When a metal helmet is too heavy, a warrior should turn to a leather helmet to provide the protection you need with the mobility you desire. Each and every one of the leather helms featured here at Medieval Armour is a fantastic item that's crafted from the best quality leather, ensuring that each helmet is a piece of armor that's worthy of any warrior. And just like traditional steel helmets, these leather helmets come in a wide variety of styles. 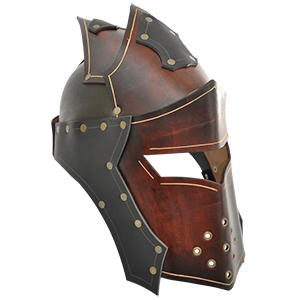 Unlike steel, though, with a leather helm, you don't have to worry about something like rust! We have fantasy leather helmets that are perfect for creating a distinctive and unique look for a warrior looking for something new and interesting, just like we have leather medieval helmets for a more traditional warrior that's looking for something that's historically accurate and lightweight. And if you're a warrior that's searching for something historic, then you're in luck, because we have leather Norman helmets, Greek leather helmets, fantasy styled leather helmets and so many more different styles! And since some of these helmets are made from hardened armor-grade leather, they can hold up well in combat, making them fantastic SCA leather helmets as well as great reenactment helmets in general! You can even wear them as a LARP leather helmet, if you're looking for the maximum level of protection possible! Just because you don't want to wear a metal helmet doesn't mean you're out of luck. All you have to do is check out the Leather Helmets section of Medieval Armour and you're sure to find just the leather helmet you need to keep your skull safe. The Middle Ages covered a sizeable span of time, and that was time enough for the helmet to undergo many radical changes. And that's why the Medieval Helmets section of Medieval Armour is so full of different styles, because between classic medieval helmets and newer renaissance helmets, there were a lot of helms for a warrior to choose from. There is no one true medieval helmet, simply because, as stated above, the helmet underwent a lot of changes during medieval times, as warriors were constantly adapting their armour to suit the most pressing needs possible. This is why our medieval helms are so varied. If you're looking for a functional helmet, though, you've come to the right place, as you'll find functional varieties of all manner of historic helmets. Knights, crusaders, and Templars will find that the bascinet helmet, the great helmet, the sugar loaf helmet, and the sallet helmet are all typical of what many defined as a knight helmet or a crusader helmet. The regular soldier, on the other hand, will feel right at home wearing the kettle hat, the spangenhelm, or the barbute helmet, which are simpler, but no less protective. Virtually every helmet you'll find here is a steel helmet that's designed to take some level of punishment, although some are meant more for the rigors of combat while others are made first and foremost for their looks. 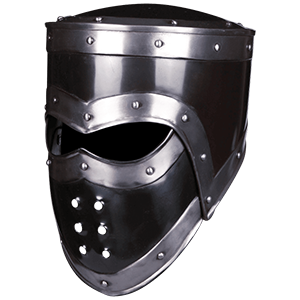 You'll also find a number of great SCA helmets here, which are designed to take good knocks and provide more than adequate protection when facing a weighted and blunted training sword. Although there typically isn't any one perfect helmet for any particular style of warrior, you are almost certain to find one or more perfect medieval helmets for you to wear whenever you browse through Medieval Armour's section of Medieval Helms and Helmets. Not everyone who picks up a helmet does so with the intent of wearing it. 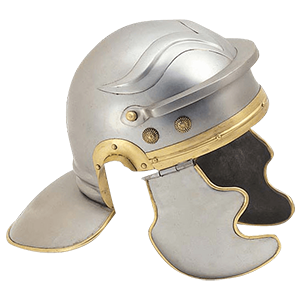 Collectors and historians of every age find helmets that appeal to their sense of aesthetic, and for those individuals, Medieval Armour carries a wide assortment of helmet stands and armor stands for displaying any and all of your historic war gear. Many of our helm stands are distinctive yet simple, serving to proudly display any full-sized helmet. Also of benefit is that many of these display helmet stands won't detract or add to the helmet's appearance, serving only to hold the helmet and let the helmet stand entirely on its own as a distinctive and attractive display. 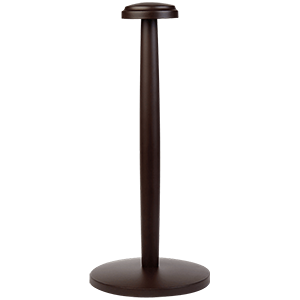 Many of the stands we offer are wooden helmet stands, although we do offer a few metal helmet stands as well. And if you're looking to put together your own medieval armory, then we also have armour displays and armour stands as well, which are perfect for showing off any pieces of chainmail or plate armor that you might have. Some of our stands are even integrated with one another, allowing for helm and cuirass to be combined on in an amazing armour and helmet display! Like our helmet stands, most of our armour displays are wooden armor stands. You'll really create a distinctive display when you show off your favorite helmets and armors with any of the helmet and armour stands that you find here at Medieval Armour.